When is the monsoon (rainy) season in Nepal? What kind of physical shape do I need to be in to trek to Everest Base Camp? What are accommodations like in Kathmandu and while trekking? Will I sleep in a tent during the trek? Can we take showers during the trek? How do we clean ourselves? Can I recharge my iPod while on the mountain? What is life like at Everest Base Camp? 1. When is the monsoon (rainy) season in Nepal? The full monsoon season in Nepal is typically from mid-June to mid-September. July and August are the rainiest months. We offer a trek in the spring and in the fall to avoid the rainy months. If your objective is to enjoy the camaraderie of Everest Base Camp, you are best to travel in the spring during the Everest climbing season. In the fall, the weather is particularly lovely and the reddish autumnal hue to the landscape will take your breath away. 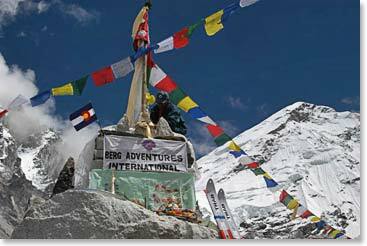 We also offer a shortened Christmas Trek that travels as high as Pangboche at 15,000ft/4,570m. Lodges above Pangboche are typically closed during the winter months, but you can expect very sunny and dry weather through the winter season. 2. What kind of physical shape do I need to be in to trek to Everest Base Camp? Excellent cardio-vascular conditioning and muscles that are used to hiking will make your trip much more enjoyable. Our goal is to climb Kala Patar at 18,700 feet, and walk on broken glacial moraine all the way into Base Camp, at 17,500 feet. You will spend 16 days in a land where life is simple, trails are steep and the air is thin. Begin training today if you want to get the most from this trip. 4. What are accommodations like in Kathmandu and while trekking? Kathmandu: We stay at the Yak and Yeti hotel, or another of Kathmandu's finest hotels. Trekking: We stay in a combination of clean and friendly Sherpa lodges. Our own cook staff will prepare all meals. 5. Will I sleep in a tent during the trek? No. We will be staying in beautiful lodges (some with private bathrooms!) throughout the duration of the entire trek. For more information about why we choose lodges over tents, read our Lodges versus Camping in Nepal article. You will notice on the itinerary that we take 11 days to walk from Lulka at 9,200 feet to base camp at 17,500. At Namche and Pheriche (11,400 ft and 14,000 ft respectively) we take rest days to allow our bodies to adapt to higher altitudes. This schedule, combined with a conscientious attitude about paying attention to our own bodies and to one another has proven successful time after time. 7. Can we take showers during the trek? How do we clean ourselves? 8. Could you give an example of a typical breakfast, lunch and dinner on the trek? Our Sherpa cooks are masters at preparing varied, healthy meals. They use almost exclusively fresh, whole ingredients. Produce and staples are purchased in the Kathmandu Valley and transported to the Khumbu via helicopter charter. Fresh meat and other supplements are purchased in Namche or along the way. Vegetarians rarely have a complaint on Nepal Trekking trips. Meat is served, but is always an addition to the main courses. Dal Bhatt (rice with lentils) and several other local Neplase and Tibetan dishes are featured throughout our trek. They quite often become the favorites and are the "most requested", but there are always other options at any meal where they are served. Lunch: Yak steak with chips (french fries), rice with lentils, cauliflower, toast with peanut butter and jam, cookies, fresh apples, hot drinks and tang. Dinner: Soup, pizza, fresh green beans, mashed potatoes, bananna fritters, hot drinks. Photography on a trip to Nepal can be especially rewarding. Plan to take pictures of people, especially close ups of smiles and expressions. You will not forget to take pictures of the grand scenery all about you, Everest, Ama Dablam, Pumori and the other great peaks. A camera that you are familiar with will be better than one you are learning to use. Small "point and shoot" cameras will always be used because they can stay handy in your pocket. However inexpensive point and shoots can become unreliable in cold temperatures and dusty conditions. Digital cameras offer the flexibility and economy of working without film. Look for one that is simple, rugged and well sealed. Many models of “point and shoot’ digital cameras tend to be quite fragile in the dust and cold of climbing on Island Peak. Look for a camera that is portable enough to be transported easily, yet not so small that controls will be difficult to work with gloves on or with cold fingers. Rugged SLR film cameras and higher quality Digital SLR’s offer the flexibility of interchangeable lenses and normally perform better in extreme conditions. Even though they are heavier, they are worth bringing if you have experience using them. 10. Can I recharge my iPod while on the mountain? It will be easy for you to recharge your iPod, cameras and other devices in the Khumbu. Some of the solar systems we use there will take the regular 110 type plugs which you already have. The most common adaptor plug that you need to use is the 220 type that has the two round prongs that are sold in stores in Canada as the type for "UK, Asia." There are other three prong types that are used in Kathmandu, but we advise people not to worry about this. When you get to Kathmandu you can buy all the simple plug type adaptors that you need. They are sold in the hotel gift shops and at many stores and kiosks on the street in Kathmandu. 11. Do you have access to radio communications for any emergency needs? Our primary means of communication with Kathmandu and the rest of the world is our satellite phone. In addition to our phone, regular phone lines are available as far as Tengboche, pay sat phones are sometimes available all the way to Gorak Shep. 12. What is life like at Everest Base Camp? During the trek, we will spend an afternoon at Base Camp visiting with climbers and getting a feel for life as an Everest climber. Read this article from our 2013 Everest Expedition to learn more about popular activities at Base Camp!